The goals of this post are 1) Push out a trusted root CA certificate via group policy; 2) Enable certificate auto-enrollment for users; 3) Test domain sign-in via a smart card. I'd also like to test smart cards with my employer's web-based ticketing system, but that can be done later. The Certificate Authority is what you need to issue certificates in the first place. 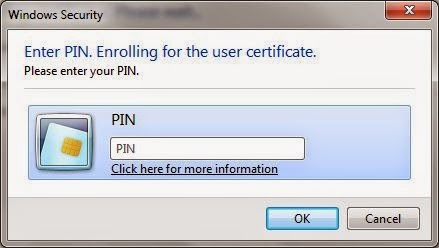 The Certificate Enrollment Policy Web Service and Certificate Enrollment Web Service work allow non-domain joined computers and devices enroll for a certificate via HTTPS (e.g. cross forest scenarios). 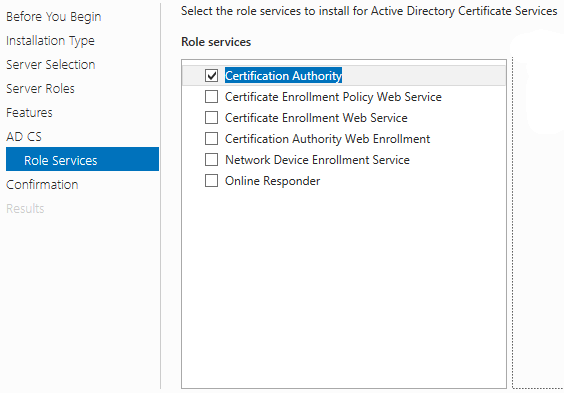 The Certification Authority Web Enrollment lets you request certificates and more through a web interface instead of via the MMC snap-in. It's a convenient way to go. The Network Device Enrollment Service allows devices to obtain a certificate from your CA using the Simple Certificate Enrollment Protocol. Sonicwall routers can do this - I'd like to try that out. The Online Responder appears to be an alternative to the CRL (certificate revocation list) in that a computer can check via HTTP whether a cert is valid or not. I'm not entirely clear on the pros/cons of using it with smart cards. Duplicate the Smartcard Logon template. 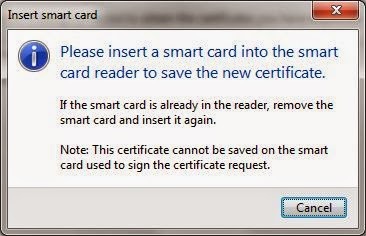 Under the "Request Handling" tab, set the purpose to "Signature and smartcard logon". Under the "Cryptography" tab, set the Provider to "Microsoft Base Smart Card Crypto Provider". Under "Issuance Requirements", set the number of authorized signatures to 1. Enable both certificate templates on the CA. Log into a domain-joined Windows 7 workstation as the domain Administrator; open certmgr.msc. Request an enrollment agent certificate. Connect the smart card reader and card. Drivers for Gemalto cards are installed automatically via Windows Update. That's the other nice thing about Gemalto cards - the middleware for them is baked right into Windows. Enroll in a smart card logon certificate on behalf of the chosen user account. It will prompt you for a PIN. The default Gemalto PIN is 0000. You can change this later by pressing Ctrl + Alt + Del, just like the password for your domain user account. All set. You may sign in to Windows with this smart card + PIN now. Now, the next annoyance that I noticed is that when I lock the console, I'm required to press Ctrl + Alt + Del to unlock it again (now that it's domain joined), so I enabled a group policy to disable this behavior so frequent console locks remain practical. 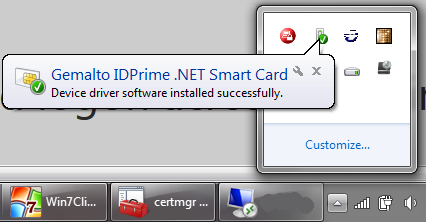 I didn't try it out, but supposedly you can put other certificates on a Gemalto smart card with the Gemalto Minidriver Manager. 2) Duplicate the certificate template that you're interested in and enable auto-enrollment for the appropriate group of users. 1. certutil -getreg ca\ValidityPeriod - this should show "Years"
2. certutil -getreg ca\ValidityPeriodUnits - this should show "2"